Looking for a gentle and painless medi-facial that literally vacuums out the impurities that have been partying it up in your pores and improve skin tone and texture at the same time? Then you should definitely know about this K-beauty skincare craze! 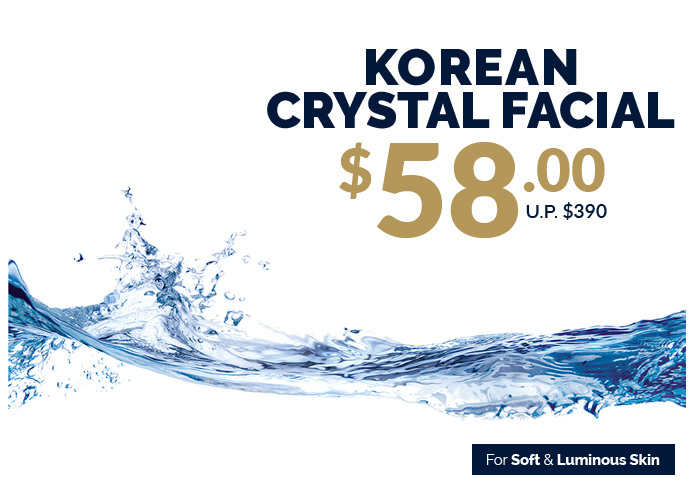 Introducing the "Korean Crystal Facial"
The Korean Crystal Facial is the ultimate all-in-one revitalizing medi-facial complete with deep cleansing, exfoliation, extraction, intense hydration and optimal nourishment to the skin. Even if you may not suffer from severe acne or any skin problems, your complexion will still benefit from this treatment. Your skin will be deeply cleansed with simultaneous exfoliation and topical infusion of specialty cleansing solution. This process softens blackheads and impurities that are clogging your pores and will be removed using a vacuum-powered system. It does not use any abrasive particles that may cause skin irritation. A selection of topical solution specific to your skin condition is infused into the skin for optimal exposure and absorption. Lastly, a soothing face massage improves blood flow and circulation in the skin, followed by a soothing and calming mask. Disclaimer: All present visual information are advocated by actual customers and representatives, which do not necessarily reflect or represent 8 Medi Aesthetics. Treatment results and experience may vary by individual. Copyright © 2019 - 8 Medi-Aesthetics Centres. All rights reserved.